Wood primer for wood prone to moisture eg. Bathrooms, kitchen worksurfaces, window sills etc. Due to its high physical wood protection, it is well suited for coating wood that is susceptible to blue stain. Osmo Wood Protector is strongly water-repellent. Osmo Wood Protector is ready to use, please do not thin. Old paints and lacquers must be completely removed. Fill small cracks, larger joints or holes in wood (with Osmo Wood Filler). 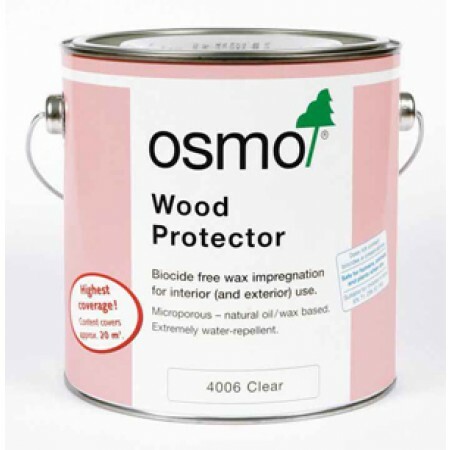 Osmo Wood Protector is compatible with all conventional types of glue and putty (except for products containing silicone). Apply one coat to the clean and dry wood with a natural bristle brush, microfibre roller. A top coat finish should be applied within one week.